The series was launched uncut on May 6th, with episodes 1-15 available immediately for free. Each week there will be a further 15 episodes released for all you anime fans out there with the concluding episodes 61-74 streaming on June 3rd. In addition to being made available on Vizanime.com, the episodes will also be made available on streaming content provider www.Hulu.com. The series centers on Dr. Kenzo Tenma, a brilliant neurosurgeon, who risks his career to save the life of a critically wounded young boy named Johan. Fast forward nine years and Johan is now a cold-hearted, yet charismatic young man who mysteriously reappears amidst a slew of unusual serial murders. What would you do if you realized that the boy you rescued all those years ago had turned out to be a monster? Dr. Tenma is forced to go on the run from the police, who believe him to be responsible for the murders, in search of Johan to put a stop to the monster he unleashed on the world and clear his own name. The series is choc full of conspiracy, murder and secret government experiments set against a backdrop of formerly communist Eastern Europe. 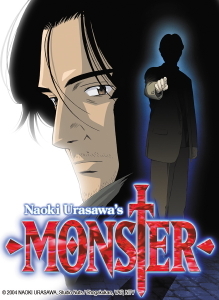 Dripping with suspense, Naoki Urasawaâ€™s â€œMonsterâ€ has a thrill at every turn. VIZAnime is a free-to-use interactive web destination that is now the permanent home to some of the best-loved animated series (rated T+ for teens). To watch the prestigious Eisner Award winning series visit www.VIZSignature.com/monster.